Gentle enough to use on face, body and hands. I am not a big soap user. I tend to use liquid soap for washing my hands and cleanser for my face and body. I really like L'Occitane soaps though, this one is really good. The soap feels good quality and does not go mushy after several uses. It lathers really nicely and has a gentle scent. It is gentle enough to use on the face and body. It does not dry the skin like most soaps, you feel like you have used a moisturising product. The soap comes nicely packaged. I wouldn't normally think of giving soap as a gift but I would give L'Occitane soaps as they look special. A good hard bar of soap, which doesn't melt away in the bath so last a long time making it great value for money. Still lathers well and has a luxurious honeysuckle sent that stays even when washed off. Simply packaged in a plastic film wrapper - no excess packaging. Leave skin soft and not dry like a standard soap. I've been using L'Occitaine soaps instead of shower gels, as I actually find it more cost effective, and it leaves my skin just as soft. I love L'Occitane products as they are not tested on animals and full of lovely plant based ingredients. this lathers up beautifully with a nice creamy fresh honeysuckle fragrance. the scent last on my skin even after I have dried off which I like. the bar lasts well as although it lathers well it isn't a soft soap that melts away in the bath when used. 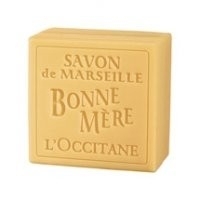 I love this and other L'Occitane soaps as they are affordable luxuries. This soap is a great size and lasts for ages making it fantastic value for money. It lathers up well and has a gorgeous honeysuckle scent,leaving skin clean and smelling fresh. You have never used soap like this before..!